Decision Trees are pretty cool. I started learning about DTs from Jeremy Howard's ML course and found them fascinating. In order to gain deeper insights into DTs, I decided to build one from scratch. This notebook/blog-post is a summary of that exercise. I wanted to start blogging about DTs (and Data Science in general) once I became adept in the field, but after reading this FCC article I've decided to get into it early. So let's get to it. A few good things about DTs are: - Since they're based on a white box model, they're simple to understand and to interpret. - DTs can be visualised. - Requires little data preparation. - Able to handle both numerical and categorical data. I'll be using the ID3 algorithm to generate the DT. ID3 uses Entropy and Information Gain to generate trees. I'll get into the details of the two while implementing them. Let's code this up in Python. I'll be using the titanic dataset from Kaggle. This is how the original data looks. For the sake of simplicity, I'm dropping NA rows. Since I'm trying to replicate the functionality of a DT from scratch, I'd like to start with a small dataset with a small number of columns. 'Name', 'Ticket', and 'PassengerId' are mostly useless for me here. Dropping 'Cabin', 'Embarked', and 'Fare' to keep things simple. Okay. This is how the data looks like now. Time to code up the metrics. I'll start with the most naive versions of them, with very less focus on optimisation. Entropy H(S) is a measure of the amount of uncertainty in the (data) set S.
When entropy=0, the set S is perfectly classified (i.e. all elements in S are of the same class). Information gain IG(A) is the measure of the difference in entropy from before to after the set S is split on an attribute A. In other words, how much uncertainty in S was reduced after splitting set S on attribute A. Okay, now that we have the two metrics implemented, time to write a simple function that builds a tree. It finds the best column to split on using the above two metrics, and recusively generates the tree as a Python dictionary. Recursion stops when all elements in a node belong to a single class. Okay. So the function seems to work. One of the best things about a DT is that it can be visualized pretty easily. Let's do that. I'll use the awesome graphviz tool and pydot to visualize the tree. Okay! So I did manage to create a decision tree. Although it doesn't quite look like a traditional decision tree where nodes represent columns and edges represent values. I'm not gonna bother with that for now. In this version, one node represents the column to split on and the following node represents the value taken. But I can see one problem with this kind of structure. As per this implementation of classic ID3, one node will be split into as many child nodes as the number of unique values that node can have. So in the above tree, Pclass is split into 3 child nodes as it can take the values 1,2,3. I intentionally didn't use the columns which can take continous values for creating this tree. Let's add the column age to our dataframe. Oh boy. It seems that this algorithm will have a tough time with continous values. Time to tweak it so as to handle continous values properly by doing binary splits. 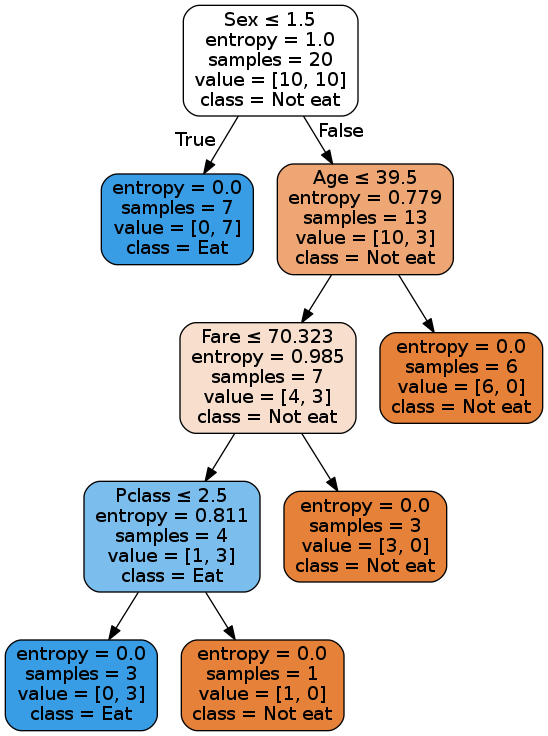 This is the default implementation of decision trees in scikit-learn. Entropy implementation remains the same. Information Gain implementation has to be changed a little. Instead of iterating over all possible values for a column, I'll just use a split point to create two subsets. And since I'm using a split point, which is a number, the entire dataset will have to be converted into numerical values. I'll do it later. find_best_split takes a dataframe and finds the split which results in maximum info gain. Basically it iterates over all columns, and all possible midpoints of the values of a column and finds the best split. Note to self: A lot of optimisation pending here. build_tree_binary is similar to the previous build_tree, the only difference being it only creates two subsets based on a split point. Condition used to split on is "less than or equal to". So, the elements satisfying this condition are placed in the imaginary left node, and the others in the right one. Okay, so I'm using some functions from the fastai library to prepare the dataset for building the tree. train_cats converts string columns to columns of categorical values. proc_df splits off the response variable, and changes the dataframe into an entirely numeric one. Boo-yaa! Our tree is making the same decisions as the scikit-learn's tree. One point to note here though: Since the dataset is very small, as we approach the leaf nodes, different splits will result in same information gains. So the decisions near the bottom of the tree may vary as I randomly choose a column to split on in the case of same info gains. This is the first version of the ID3 DT written from scratch. Obviously, things can be sped up a lot by making use of numpy and vectorization. But my aim for this exercise was to understand the underlying logic used to build a DT, and creating one from scratch definitely facilitated that. Next, I'll be building a DT using the CART algorithm.